The leading British-born country act, the Shires, have created history by signing a new deal for the US market with Big Machine Label Group's Dot label. They thus join such prominent artists in the BMLG camp as Tim McGraw, Florida Georgia Line and Thomas Rhett, and become the first UK act to pact with a major, US-based country label. The deal brings them under the wing of one of the most influential figures in modern-day country music and the man who signed Taylor Swift, BMLG president and CEO Scott Borchetta. The duo of Ben Earle and Crissie Rhodes, who are signed to Decca in the UK, recently followed the gold certification for their debut album Brave with a No. 3 debut at home for the follow-up set My Universe. The sophomore album, recorded at Nashville's prestigious Sound Stage Studios, became the fastest-selling UK country album of all time. “We are absolutely thrilled to sign with Dot Records in the USA,” said Earle and Rhodes. “The UK is our home and we are proud of our success so far, thanks to Decca Records, but it’s always been a massive goal for us to build our presence and make a name for ourselves in the USA. “Scott was one of the first people to approach us as a band, after hearing our original demos nearly three years ago. His advice back then was clear, to break the UK first and come to the US with a story. We took his advice and are extremely excited to be working with him and his team in the US. 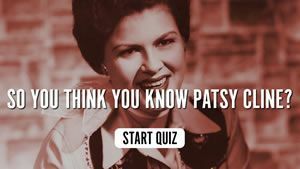 So You Think You Know Patsy Cline? Shania Twain Vinyl Reissues… Impress Us Much!